Here are a few dresses that I have and absolutely love!! They are easy as they are beautiful! You will not be disappointed. Just a few ideas if you are on the lookout for a little number for this summer. Now let's enjoy this summer to the fullest! Thank you so much for reading! I love your comments/suggestions. I read each one of them and I appreciate you taking the time to leave one. Unauthorized use and/or duplication of this material without express and written permission from this blog’s author and/or owner is strictly prohibited. Excerpts and links may be used, provided that full and clear credit is given to Luba and Luba Lovely with appropriate and specific direction to the original content. 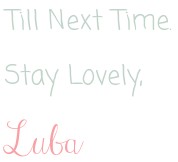 © 2012-Present Luba Lovely. Powered by Blogger.